I think it’s true when they say that our generation like things to be handed to us. We have this sense of entitlement, believing that we should all be millionaires and yet some of us aren’t willing to sit down and create ideas worth buying. One day Ruth the foreign woman who returned with Naomi from Moab approached Naomi with a request. Ruth: Let me go out into the field and pick up whatever grain is left behind the harvesters. Maybe someone will be merciful to me. Naomi: Go ahead, my daughter. It’s crazy the amount of times I have sat down and thought “Joy, WHY didn’t you think of YouTube? Why didn’t you create Facebook? What have you been doing? !” In truth, there is no shortage of ideas but I have to ask myself if I am willing to pour myself into a new project. I ask myself how prepared I am to take the steps after the idea has been birthed and how faithful I will be when following through. The answers to these questions usually stop me from thinking up the next social networking site. What I love about this passage is that it shows us what we should do when we have new ideas. Ruth didn’t wait for someone to have mercy on her and hand her success (or food lol), she had an idea, followed through and positioned herself for the next phase of her life. Ruth took initiative and worked hard, bringing what was just an idea into being. Let me go out into field and pick up whatever grain is left behind by the harvesters. How humble of Ruthie, taking the ‘leftovers’. How many of us would be willing for others to know when we desperately need help? How many of us would even be willing to toil in the fields? We are so concerned by the opinions of others that we could be starving and yet still refuse to place ourselves appropriately in the field to receive the help we need. People can only help us if we show them that we need help. I used to get so angry because I would give so much time and advice to others, but find myself alone when I was battling an issue, because I just expected those around me to just know that I was going through a rough patch. I’ve learnt that after kneeling before God in times of trouble, we must dust off our knees and seek help from those that God has placed around us. This might mean going out into the field and hoping someone leaves the scraps behind or it might mean telling a trusted friend that we need to borrow some money because we cannot afford food that week. As my sister often says, there is no dignity in poverty – we have to reach out! She came and asked my permission to pick up the grain our harvesters leave behind and gather it all into sheaves for herself. Except for one small break she has been here all day, working in the field from the morning until now. Good old Ruthie, once again showing us there is a better way to live. I love that Ruth was hardworking. She only took a small break and worked from the morning until whenever Boaz made his grand entrance. How many of us take pre-breaks? Oh, you’ve never heard of a pre-break? During my lazier years I would take a break BEFORE the work had even started just to prepare myself mentally for the work that was ahead. Of course, I know now that a pre-break is simply procrastination – which is a “thief of time and a killer of destiny”. I honestly just hated doing any form of work during those years. The question is how much more would we all achieve in our day-to-day lives if we pushed ourselves to the limit and stopped taking excessive food/toilet breaks that when tallied up probably last longer than the time we’ve spent working? Ruth was in a desperate place – if she had not worked, she would not have eaten and at this point in their lives there was no one else to ensure that this happened. Some of you reading this feel just as desperate as Ruth did and are still not working as hard you should be. Listen, faith without works is DEAD (James 2:17). You can pray as much as you want but if you don’t set that alarm, wake up on time and send out those job applications, you’re still gonna be praying for a job 5 years from now. We have got to work hard – we have to be great! I am so passionate about being excellent in every aspect of my life and doing everything with my heart turned towards Christ, knowing that I should only offer my best because ultimately I work for Christ, not myself or anyone else (Colossians 3:23-24). Work hard, work tirelessly, work relentlessly and work with everything within you. Yes, take small breaks but then go again, harder than you did before. Ruth 2:9 Watch the harvesters, and see which field they are working in. Follow along behind these servants of mine. I have warned the young men not to touch you. If you are thirsty, go and get a drink from the water jars my young men have filled for the harvesters. Now onto Mr. Boaz, our knight in shining…sandals? I know some women are praying for their Boaz to arrive and until reading this I didn’t really understand why. Oh, but now I see! Boaz was great. Boaz was rich. Boaz was perceptive and intuitive. Boaz was a believer. Boaz was respectful. 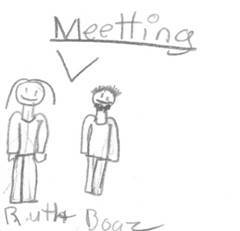 Boaz found a way to both protect and provide for Ruth in their first interaction. What a GUY! I can definitely see why some women are asking God to send a Boaz their way. Ruth 2:11 Boaz: I have heard your story. I know about everything you have done for your mother-in-law since your own husband died. I know you left your own mother and father, your home and your country, and you have come to live in a culture that must seem strange to you. The reason I loved Boaz was because he saw Ruth’s heart before anything else. He was drawn to her heart before he was drawn to her body, beauty or intelligence. Some of us women are building our lives around a man we haven’t even met yet by doing this, not doing that or by trying to attain attributes we believe he will desire in us. I feel it is important to note that Boaz helped Ruth because of what Ruth did long before they met, not because she manipulated or changed herself to suit his (potential) needs prior to their meeting. Oh. I am giving you all kinds of truths in this post! ANOTHER key point: Ruth’s reputation went before her; Boaz had heard her story before they met. Listen! I am not here to tell you how to carry yourself as a man or woman but I will say that people will always talk and your actions, good and bad, will often determine what is said about you when you are not around. That may not necessarily be a reason to act differently but it is certainly something to think about.